I'm back in LA and have spent the past couple of days suffering from Shanghai withdrawal. SH was both a trip down memory lane and a shake of the magic eight ball as I got a glimpse of what my future may hold. The forecast is bright, exciting, and completely intimidating which means work will soon go into overdrive and overtime mode. Much apologies for being so cryptic but all will be revealed in due time! After coming back, I went dark for a few days spending it in sweats while super glued to my bed. In Shanghai, I was surrounded by noise and people 24-7 so I needed some time cut off from the rest of the world when I got back. Is that weird? I grew up as an only child so I'm perfectly content with self-imposed solitary confinement. My cocoon was warm, peaceful, and addicting but was finally shattered by a busy Wednesday of meetings, a Jigsaw London photo shoot, and the Hudson Jeans x Flaunt Magazine Denim After Dark party at Chi Lin. Just like that, I was thrust back into the palm trees jungle of LA. 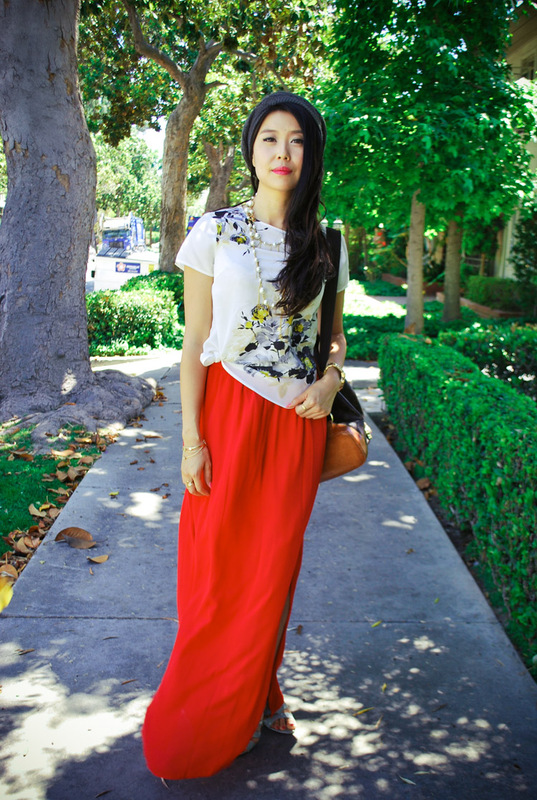 For my LA re-debut, I wore my Oasis silk floral top and red maxi skirt. Accessorized with a knit hat, my LV Montsouris and Chanel pearls, it's the perfect summer outfit that can truly go the mile. Without exaggeration, I can wear it everywhere...from Wednesdays in LA to summer music festivals and all the hot nights in between. The versatile outfit is a classic take on laid-back boho Cali style! To celebrate my homecoming and the start of summer, I've teamed up with Oasis to give away a $100 gift card to one lucky reader. Deets after the pictures! 4. Bonus entry: tweet "I want to win the @goodbadandfab and @OasisFashion $100 gift card giveaway!" love how ur lips match ur gorgeous skirt! oh I love maxiskirts, you look so cute! 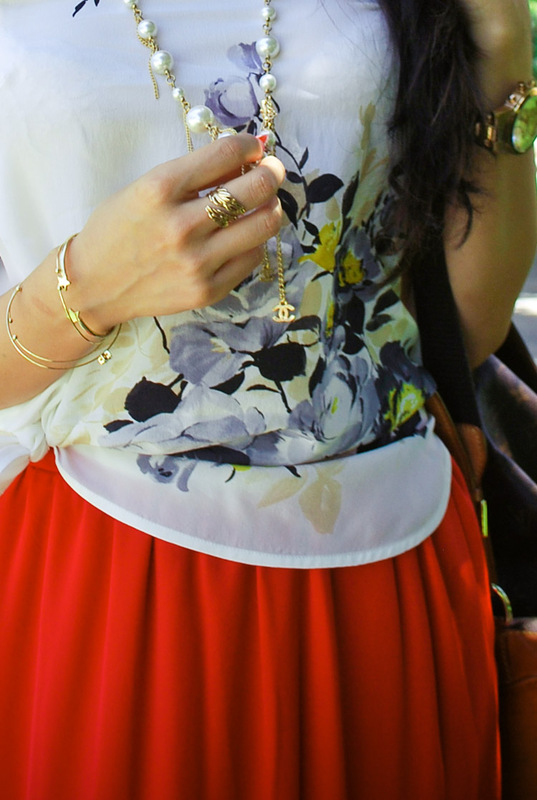 Love your punchy red skirt! I'm so glad you had an amazing time in Shanghai. I'm not an only child but I totally know what you mean about needing some alone time to recharge, especially after an overseas trip! the color of the skirt is eye-catching! LOVE your orange skirt. You look so amazing and so chic! Too cute. Love that skirt. Love this the floral top you are wearing! You look beautiful btw:-) Hope you are having a wonderful day! 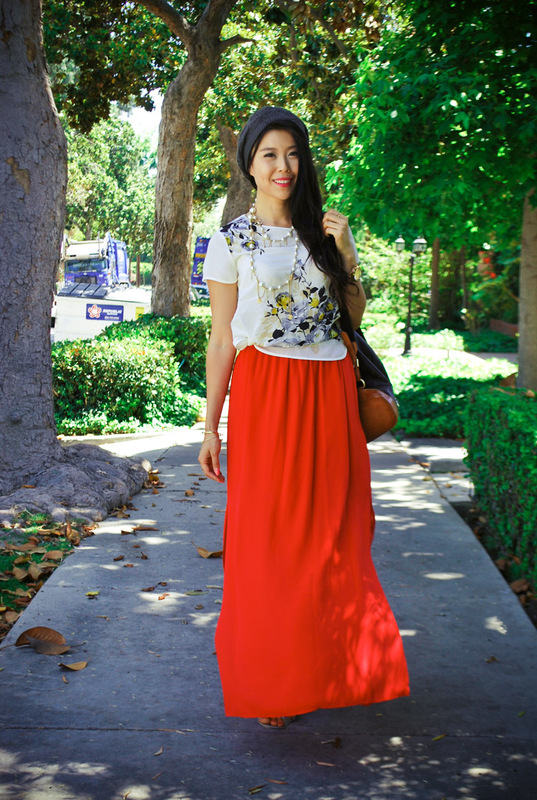 Love your maxi skirt, I want one in a nice bold colour like that too. Shanghai sounds great if you already miss it, I'd love to visit one day! 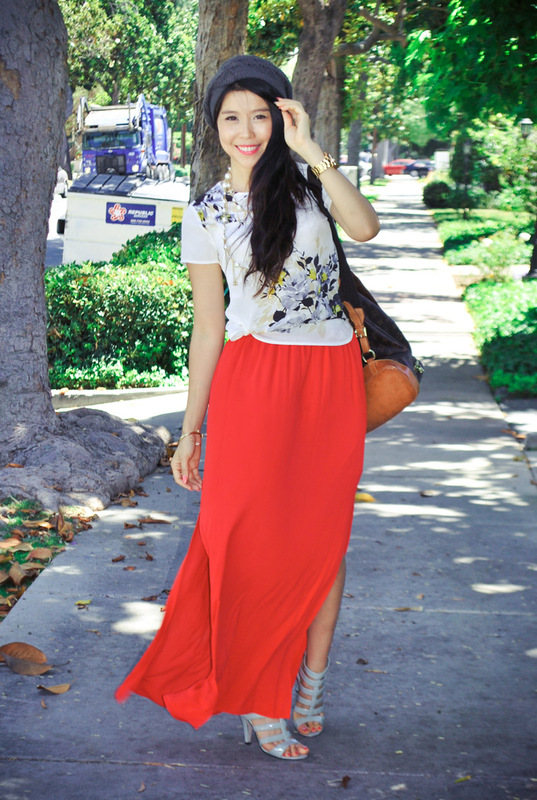 That is such a fabulously bold red on the maxi skirt...LOVE! That red is amazing. Very eye catching colour and the Jewells look so glossy which gives you a supper look. i love your look so much. and i agree with you, you can wear it everywhere, very versatile. clever work and reporting! Keep up the fantastic works guys I've included you guys to my own blogroll. You look fantastic. I love your shoes! The perfect festival outfit for me is a white tee, COIN 1804 foldover panel tie dye maxi skirt, gladiator sandals and a crossbody bag! Followed you on Bloglovin under MC Chau! its a perfect summer look ! you are very beautiful, compliments!!! Great combination. Love this skirt. You're invited to enter my $ 50 gift card Giveaway on Wizards of the West, Open to USA and Canada until June, 2nd ! Hi sweety, you look so pretty, love the vibrance of for skirt and its perfectly paired with the cute top. Thanks as always for your wonderful words over at mine! Have an awesome weekend! you have great sense of style!love your blog! If you want to return to visit us and decide to follow our blog noin reciprocate! You look so refreshed & adorable as ever....welcome back to the grind....love that bright maxi!!! So stunning! Your outfit is so fabulous! This outfit fits perfect to you and your actual mood and I like the shirt! And no, you aren´t weird in my opinion, I for myself would have need some quiet time after this busy trip to SH, too! Hope you relaxed now completely. Followed you bth way and liked oasis. Perfect summer outfit is: cropped jeans with studs and a fringe top, lots of bracelets and souchy boots. Lovely outfit! That skirt is to die for. I love YOUR outfit as the perfect festival look! So versatile & feminine! When I go to music festivals I love to wear a pretty sundress, or cute shorts with a peasant top & comfy flats. oh you look so great, I love you style and your red skirt is fantastic! Crochet bikini, sundress, strappy sandals and fedora! 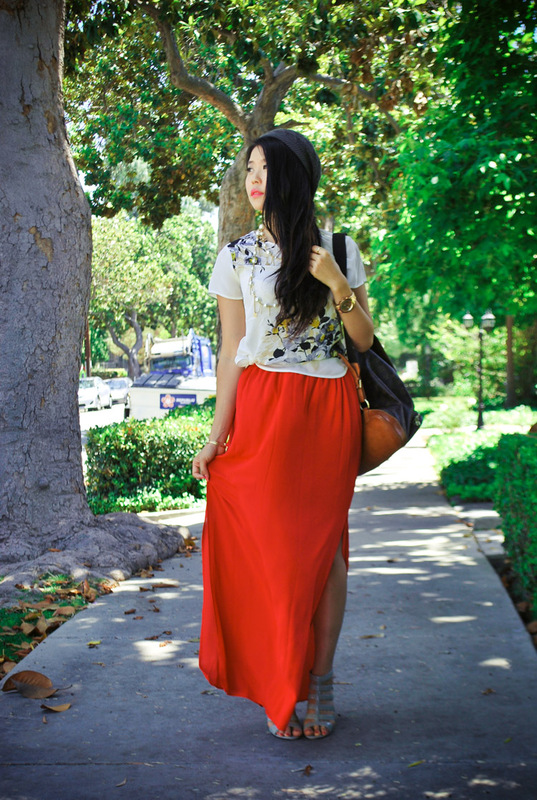 Like you on FB Lynn B.
you look genius <3 i love this outfit <3 you maxi skirt is so beatiful! I love a great maxi dress - nothing fussy, just comfy, and a great pair of gladiator sandals with a jean jacket for night/cooler weather. Thank you for your comment on my website.. I love anything boho / tribal / persian inspired at the momoment! It gives an interesting exotic and free taste to the awesome excitement of music festivals. wow, so nice, I like the Oasis t shirt.